Gloria blazes a trail . . . Published on March 11, 2016 by Martyn. Be the first to comment!
. . . to Manchester next week for the latest stage of the promotional tour. I’ll be calling in at Stretford High School, on Tuesday, right in the heart of Manchester United country (might leave my Leeds scarf at home! ), as part of the 2016 Manchester Children’s Book Festival‘s series of Trailblazer events, which take authors into schools around the city. The visit will include a talk, reading and Q&A with around 90 Year-9 students, 20 of whom will also take part in a writing workshop with me later in the day. 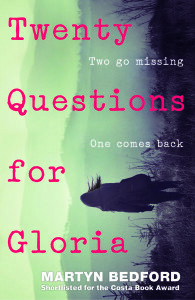 I’ll also be signing copies of my latest young-adult novel, Twenty Questions for Gloria, and handing out plenty of lovely bookmarks which my publisher, Walker Books, have printed for me as giveaways. Having taught creative writing at the University of Manchester from 2001 to 2006, I have fond memories of my time there and always enjoy going back to the city whenever I get the chance. The Trailblazer events are a lead-up to the main festival itself, which is organised by the Manchester Writing School at Manchester Metropolitan University, and runs from June 24th to July 3rd. For full details of the programme please click on this link to the festival website.